Ethernet is a standardized system for connecting computers to a local area network (LAN). Ethernet is a relatively inexpensive and reasonably fast LAN technology. For this reason it is the most popular choice by business networks and the Internet. Ethernet technology operates at the physical and data link layers of the OSI model. In an Ethernet LAN network, a protocol called CSMA/CD or "carrier sense multiple access with collision detection" is used. For example, for a computer to "talk" on the network, it first "listens" on the wire to see if there is any data traffic present (carrier sense). Every other computer on the LAN will be listening for data "traffic" and has the ability to access the network (multiple access). The devices on the network will have the ability to detect a "data collision" if two or more computers attempt to bradcast a message at the same time(collision detection). Think of a classroom full of students, each student listens for a chance to say something (carrier sense). Every student has the oportunity to say something (multiple access). If two or more students talk at the same time, they each stop talking and try again (collision detection). The official designation used by the IEEE for Ethernet is 802.3. The IEEE (Institute of Electrical and Electronics Engineers) develop standards to ensure manufacturers all follow so this way you can mix and match different technologies. Standard Ethernet transmits data up to 10 Mbps. Fast Ethernet supports data transfer up to 100 Mbps. Gigabit Ethernet transmits up to 1000 Mbps (1Gbps). Ethernet cables in use today are called Category 5 (CAT5) and Category 5e (CAT5e). The CAT5 Ethernet cable supports 10Mbps and Fast Ethernet (100Mbps). The Category 5e (CAT5e) cable supports Gigabit Ethernet. The Category 6 (CAT6) cable is standard for Gigabit Ethernet and is backward compatible with the Cat5 and CAT5e standards. The CAT6 cable provides a performance of up to 250 MHz and reduces crosstalk and system noise than the other cables. These are the cables you would connect your computer’s network interface card (NIC). That is the connection that looks similar to a phone jack but wider, remember? What is Ethernet? And why is it popular? Ethernet is popular because of its low cost and is accepted as the standard for many networks. 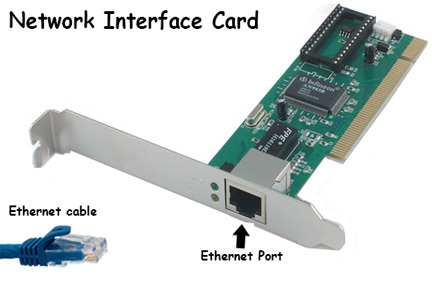 If you go to your local computer shop you will find NIC cards, Ethernet cables, and network devices that are made for Ethernet networks. Which type of Ethernet to use? The first type of Ethernet technology was called Thicknet (10Base5). Later on they created a thinner and more flexible cable called 10Base2 Thinnet. The traditional Ethernet form that offers better electrical properties than Thicknet or Thinnet, is called 10Base-T. This cable utilizes unshielded twisted pair (UTP) wiring rather than coaxial. An Ethernet cable has an 8 pin modular connector typically called an RJ-45. It uses pins 1, 2, 3 and 6 to transmit data. When reading the different standards you can figure out their speed and characteristics rather quickly. The 10 refers to the transmission speed of 10Mbps. The 5 stands for the maximum segment length of 500 meters. 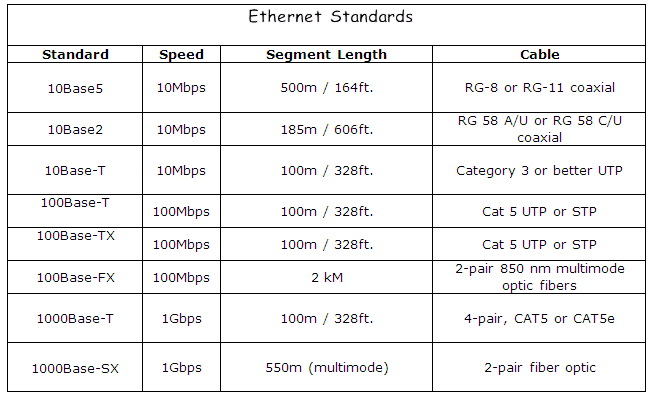 Review this chart that shows the different standards: What is Ethernet Standards? <- - -Go back a section to "What is an Intranet"
Part 1 - Ethernet Introduction - What is Ethernet?